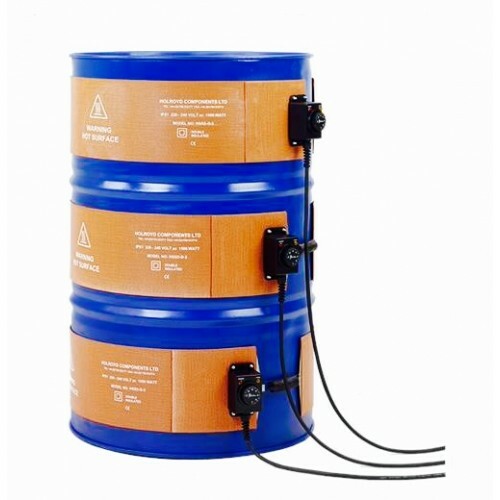 Flexible laminated silicone drum heater designed for use on standard 200ltr / 40 gallon drums. Designed to be utilised singularly or in multiple units up to a maximum of three which can be used to give quicker warm up times and higher product maintain temperatures. The HSSD is specifically designed for the melting or reducing the viscosity of soaps, fats, varnishes and oil based type products. It can also be used in conjunction with the HBD base drum heater and insulation jackets to increase product heat up times and efficiently maintain temperatures. Fitted with its own integral heat controller the unit can be left to control its own temperature. Although monitoring of the drum contents temperature would be necessary for accurate control. Applications include - wax, paints and varnish heating prior to transfer to production. Any application where drums are required to be maintained or pre heated. Drum heaters rated 1000 or 1500 watts. Available for 110V or 240V.